●	Try prescription or over-the-counter nicotine replacement therapy: nasal spray, nicotine inhaler, medications, patches, gum or lozenges. ●	Wait at least 10 minutes before giving in to a tobacco craving. ●	Chew on something like gum, hard candy, raw carrots or celery to occupy your mouth. ●	Avoid situations where you smoked most often. ●	Engage in 30 minutes of moderate exercise. ●	Talk to family member, friend or support group. ●	Remind yourself of the benefits of quitting. Infographic: How does the See Me Smoke-Free app work? When it comes to quitting smoking, women may need some extra motivation, researchers say. “Women are more likely to gain weight than men when they quit smoking, and women have more difficulty losing weight when they gain it,” said Judith Gordon, associate professor with the Department of Family and Community Medicine and associate head of research at the UA College of Medicine. She said that’s why UA researchers are part of interdisciplinary team that developed a pilot app to remind women smokers that their health is more important than being thin. The team released the free Android app, called See Me Smoke-Free, on March 30. A two-year, $366,400 National Cancer Institute grant funded the effort. Gordon said the app motivates users with inspirational messages and uses audio recordings to inspire confidence. Gordon, head of the app’s research team, said almost 100 women have downloaded See Me Smoke-Free so far. Peter Giacobbi Jr., associate professor in the College of Physical Activity and Sport Sciences at West Virginia University and part of the app’s research team, said the key to the app’s novelty is its use of guided imagery, a technique that focuses the imagination through suggestion. “I spent a lot of time with the team developing short audio files that guide people through scenes and experiences to help them quit smoking,” he said. Giacobbi said studies show guided imagery can do many things, including reducing stress, motivating people to exercise, quelling food cravings and preventing smoking. But researchers have never tried it on such a scale, he said. 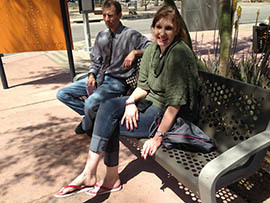 Cynthia Thomson, a professor at the UA College of Public Health and director of the Arizona Smokers’ Helpline, which offers counseling to those trying to quit, said promoting a healthy lifestyle is a good way to help kick the habit. Thomson said most people smoke as a response to stress, and guided imagery may also help smokers quit by helping them relax. “I’m not aware of any other app that’s used guided imagery to deal with the issue of stress related to smoking,” she said. Toni Runner, who was able to quit for three years after 27 years of smoking, said she recently started again because of the stress of her job. She said now she’s had to start the process of quitting all over again. She said she thinks guided imagery might further help reduce that stress. “Every little thing helps when you’re trying to quit smoking,” she said. But Traci Shelton, a smoker for 15 years who’s considered quitting, said she’s skeptical that See Me Smoke-Free could have any effect. Giacobbi, the expert on guided imagery for the app’s research team, said guided imagery will only work on those who are willing to try it. “It’s probably going to be similar to other complementary medical techniques in that if you’re open to it, it’ll be effective,” he said. Among the challenges for women who want to stop smoking: They gain more weight on average when trying to quit. 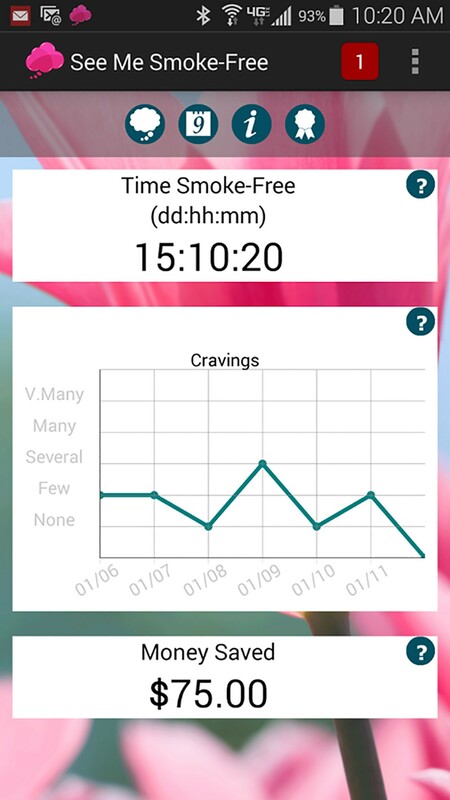 An app developed by University of Arizona researchers uses inspirational messages and other means to keep women committed to kicking the habit. Traci Shelton, right, a smoker for 15 years who's considered quitting, said she's skeptical that See Me Smoke-Free could have any effect. 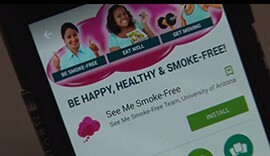 An app developed by the University of Arizona aims to address the challenges women face when trying to quit smoking.